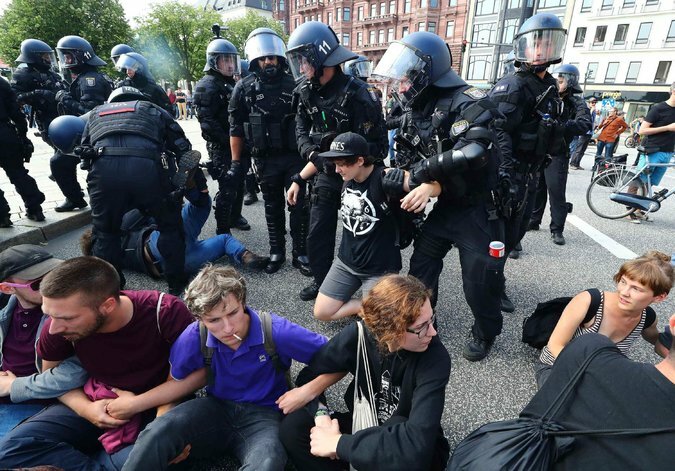 Protesters are on the streets as world leaders gather in Hamburg, Germany, for the Group of 20 summit meeting. • Several high-profile issues are on the agenda of the gathering, including climate change, global trade, North Korea, Syria and Ukraine. Leaders will also be meeting in smaller groups. 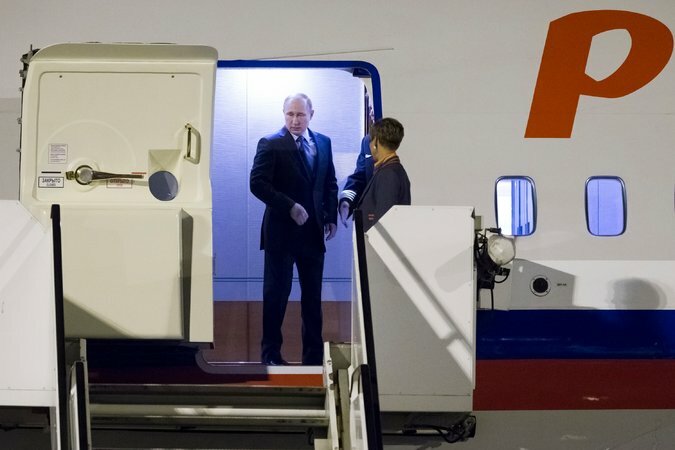 • The summit meeting is bringing together the world’s most powerful leaders, but the focus is likely to be on one particular face-to-face encounter: between President Trump and his Russian counterpart, Vladimir V. Putin. The two men have already shaken hands, though their meeting starts only around 3:45 p.m. local time. • Mr. Trump was active on Twitter on Friday morning. He described the reaction to his speech in Poland and a meeting with Chancellor Angela Merkel of Germany as “great,” and then said “everyone here” is talking about John Podesta, Hillary Clinton’s campaign manager. • Mr. Trump wants the United States to wield its economic dominance to dictate the rules of global trade, but other countries seem unwilling to follow. As if to make that point, the European Union and Japan agreed on Thursday to the outlines of a trade deal that would diminish opportunities for American companies. Protesters get an early start, and the police are there to meet them. Hamburg awoke on Friday to the buzz of helicopters and the wailing of sirens, as police officers rushed to keep up with protesters who had gathered at the city’s major intersections in an effort to block the routes G-20 leaders were to take to the Messehallen Convention Center, the site of the meeting. Protesters burned several vehicles and set fire to trash hauling bins overnight, and columns of smoke could be seen rising over the city again early Friday. Taxi drivers were avoiding the city center, some in protest, others to protect their vehicles. “We remind you that gatherings in the transit corridors will not be tolerated,” the police said on Twitter. 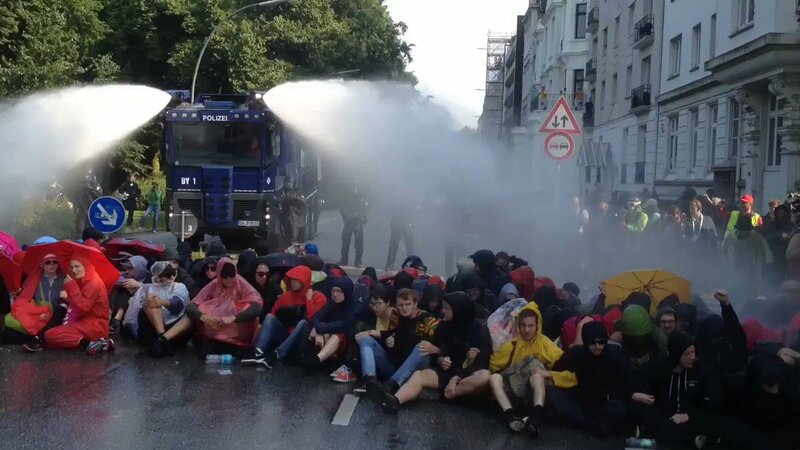 The authorities used water cannons to stop the protesters from advancing. The police presence was enormous near the convention center. In black riot gear including helmets, padding and sometimes face masks, the police stood in small groups in a quiet face-off with civilians who might or might not have been demonstrators. The authorities have said that 20,000 police officers would be deployed. Many streets in and around the city center — which is famous for its extreme left-wing scene — were blocked to ordinary traffic, though nearby public transport stations were open, albeit with increased security patrols. All eyes on Trump and Putin as they prepare to meet. The meeting later Friday between Mr. Trump and Mr. Putin is not officially the main event at the G-20, but for many, it might as well be. Mr. Trump delivered a mixed message on Russia while in Warsaw, issuing his sharpest criticism of Moscow since taking office. He called on Russia to “cease its destabilizing activities in Ukraine,” denounced its support for “hostile regimes,” including Syrian and Iran, and offered unqualified support for the collective defense principle of NATO (something he was unwilling to do during his first trip to Europe as president in May). At the same time, he broke with American intelligence agencies by saying he was not entirely convinced that Russia was solely responsible for interference in the 2016 election. In Moscow, there is the sense that Mr. Putin will be able to outwit and outposition the American leader and come out on top. “It is a win-win situation for Putin,” said Andrei V. Kolesnikov, a political analyst at the Carnegie Moscow Center, though it will not be all clear sailing for Mr. Putin. The two leaders find themselves on opposite sides of several important issues, including climate change and Western sanctions imposed on Russia after its annexation of Crimea. The Kremlin is also rankled by a missile defense system that the United States is building in Eastern Europe. They might find some common ground on counterterrorism efforts, broadly speaking. But in Syria, Moscow is backing President Bashar al-Assad, while Washington still wants to see him step down. What’s on everyone’s mind in Germany? It’s John Podesta, Trump says. On a day in which he might — or might not — confront Mr. Putin on Russia’s attempts to sway the 2016 election, Mr. Trump decided to mount a diversionary attack against an American adversary. “Everyone here is talking about why John Podesta refused to give the DNC server to the FBI and the CIA. Disgraceful!” Mr. Trump wrote in a tweetsandwiched between polite happy-to-meet tweets about Mr. Putin, Ms. Merkel, and Prime Minister Shinzo Abe of Japan. 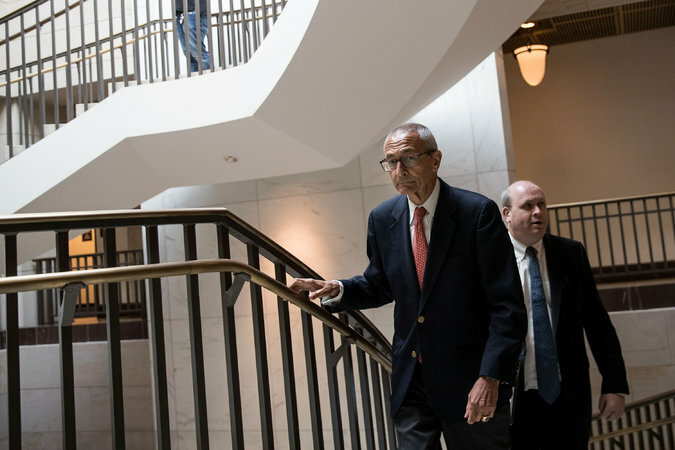 • Mr. Podesta was Hillary Clinton’s campaign chairman at the time and had no authority to turn over anything, much less someone else’s emails, to the F.B.I. and C.I.A. • Mr. Podesta — whose own emails were targeted by hackers — fully cooperated with law enforcement agencies. A ‘great’ start to G-20 meetings, Trump says. Mr. Trump, who was expected to face a tense set of meetings in Hamburg, seemed to have awakened Friday morning pining for his relatively peaceful visit to Warsaw, where a cheering crowd of Polish right-wing party loyalists applauded his speech. In a tweet Friday morning, Mr. Trump said he had a “great” meeting Thursday night with Ms. Merkel, with whom he has had a difficult relationship, and whose positions on climate change and liberalized trade clash with his own. To meet with Putin, Trump will have to miss most of a session on climate change. Mr. Trump’s meeting with Mr. Putin on Friday means that he will have to cut short a potentially uncomfortable discussion on climate change, a major element of the agenda on which he has broken with European allies. The American and Russian leaders’ meeting is scheduled to begin just 15 minutes after the start of a G-20 working session on “Sustainable Growth, Climate, and Energy,” a discussion in which the president’s decision to withdraw from the Paris climate accord is likely to figure prominently. 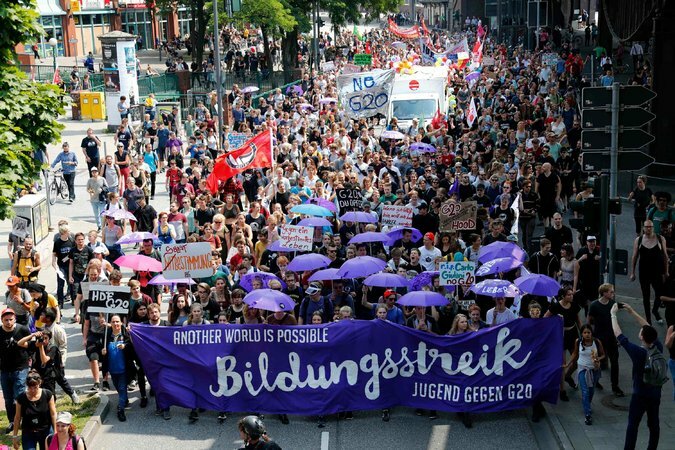 Students on the march in Hamburg. Walking along the river in Hamburg, hundreds of students skipped their classes to take part in a peaceful demonstration, chanting, “One solution, revolution” and protesting against education systems in Germany and elsewhere. “I’m here because I oppose how education in Germany is structured, that they’re training us to be workers and not thinkers,” said Hendro Myrow, 18, a student in Hamburg.